Tim got his son a Kano Computer Kit, and has offered to review of the kit for Mesomorphic. At Mesomorphic, we’re keen to get children programming computers, rather than simply using then to play games and watch YouTube videos. My son recently turned nine, so I took the opportunity to buy him a Kano Computer Kit for his birthday. The Kano is billed as a computer that anyone can make, and is aimed at children aged from 6 to 12. It’s based around a Raspberry Pi 3, and comes with a wireless keyboard, a case with a speaker, power supply, an HDMI cable, an SD card, a ludicrous number of stickers to decorate the case with, and an instruction manual in the form of an illustrated story book. All this comes neatly packed in a sturdy cardboard case, and will set you back a penny shy of £150. The instruction manual is a delight. The child is gently guided through the process of building the machine by a character called Judoka. Judoka offers sage advice along the lines of “This is your computer’s brain. It’s tiny, but powerful” and “Let’s give the brain new powers. Grab the memory card, then slide out the micro card.” The text is accompanied by simple but clear illustrations that put the cryptic diagrams we often have to cope with to shame. Unfortunately, I didn’t get to see my son put build his Kano. On the morning of his birthday, he popped upstairs to “read the instructions” while I finished washing up after breakfast. Only a few minutes later he came downstairs again to get the WiFi password to connect his newly-built machine to the Internet. So it’s fair to say the build process was quick, painless, and can be completed by an unsupervised nine year old. 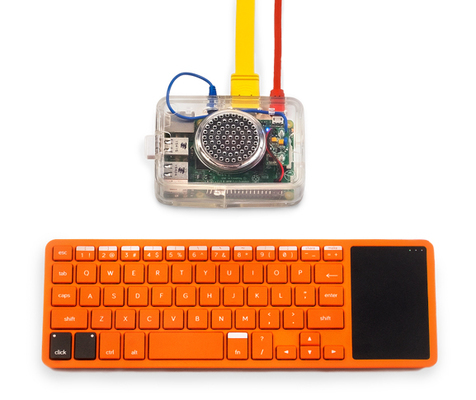 The Kano comes with a pint-sized orange Bluetooth keyboard which incorporates a track pad. It’s the perfect size for children, but not easy for an adult to use. I wasn’t convinced by the build quality: I sometimes found I had to hit a key more than once to get it to register. No complaints on that score from my son, though, and as the Raspberry Pi has four USB ports, you could always simply plug in a standard keyboard and mouse. Kano OS is based on Debian Linux, and comes with popular applications such as MineCraft and Scratch ready to run out of the box. One application that particularly caught my attention was Terminal Quest, which is a text-based adventure game designed to teach children Linux commands. For example, the player moves around the town of Folderton (did you see what they did there?) by using cd, interacts with the characters using echo, and can look for hidden objects using ls –l.